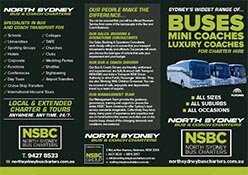 North Sydney Bus & Coach Charter have Sydney’s widest range of	Standard Buses, Mini Coaches, Midi Coaches and Standard and Luxury Airconditioned	and Seat Belted Coaches available for hire, 24/7. Our seat-belted coaches are available for school tours, sporting events	and daily student transfers to and from campus. We provide safe and reliable transportation for your special occasion or	night out. We look after your wedding guests from the church or ceremony	location to the reception venue of your choice. Contact us about our punctual	service and special wedding rates. Got people to Move? Whether you need weekly or daily services, anytime	of the day or night we are able to provide services to hotels, clubs and	the community. North Sydney Bus and Coach Charters are experts when it comes to Inbound	Tourism. We have had many years of experience looking after inbound groups	from The USA, The UK, Canada, New Zealand, Japan, Korea, Italy, Spain,	China, Indonesia – in fact all parts of the globe. No matter what corporate event you have to plan, we can provide a reliable	and comfortable ride every time. Learn more about our special rates and	packages for conferences and daily employee transport. We offer special rates for off-peak charters and high volume movements. Talk to our Sales Team today or	request a quote online.